Anne Bogel’s bookish influence is far and wide, and it has certainly made an impact on my reading life this year. 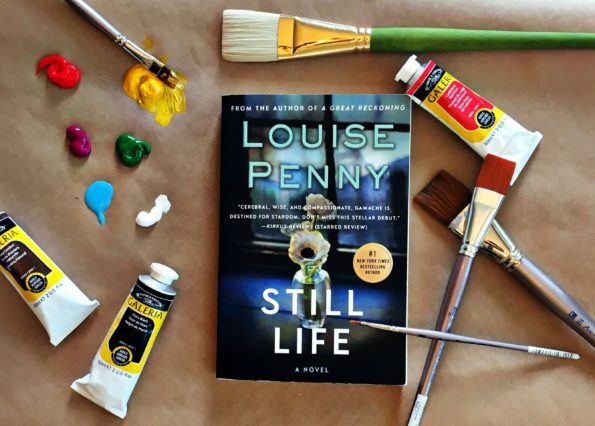 After I heard her recommend Louise Penny’s Inspector Gamache novels several times on her podcast, What Should I Read Next, and hearing Madeleine from Top Shelf Text rave about them as well, I had to give the first in the series, Still Life , a try. This type of mystery is not one I would normally reach for, but I’m so glad that I did, and I’m getting ready to settle in with the rest of the books (12!) for the next several months. Chief Inspector Gamache (of the Surêté du Québec–Penny is a Canadian author), a quiet but observant man, is called to the small town of Three Pines after a local woman, Jane Neal, is found dead in the woods. At first, everyone is convinced that her death was the result of a hunting accident. After examining the scene of the crime (and the residents of Three Pines) Gamache is certain that Jane was not accidentally killed, but murdered. As we get to know many of the people who live in Three Pines and were friends with Jane, it becomes clear that the suspect is closer than anyone thinks. This is the ultimate cozy mystery, taking place in a small town on the verge of winter. I want to go to Three Pines, even though it might actually be a murdery place. The town is the kind of idyllic place we all think we want to settle down in, and I felt like I was walking around the town when reading Penny’s descriptions of it. Gamache is such a great character. He is charming like Poirot and observant like Columbo. (On a side note, have you ever watched the Columbo TV series? It was so good!) He isn’t flashy and he makes mistakes, and isn’t afraid to admit. I so appreciate that Penny loves her characters enough to give them all flaws and make them real human beings. I keep thinking that I might run into Gamache in real life someday. The other characters aren’t ignored either. Penny lets us get to know, in detail, all the characters, not just Gamache and the main players. She develops everyone’s personalities, and that really gives the book its heart. Still Life is a study in how people often pay more attention to what is said than to what people actually do. Actions speak louder than words, if we’re listening well enough to hear them. I loved this first cozy mystery in the Inspector Gamache series, and I can’t wait to read the rest! It would be remiss of me if I didn’t mention a particularly lush character in this novel: the food. All the food. Penny describes so much delicious food that reading the book made me hungry! If you read this for a book club, it would be fun for everyone to choose a dish from the book to bring to the meeting. You’ll certainly have a lot of delicious options to choose from!